Republicans held or took ground in Tuesday’s midterm election, with Kansas Gov. Sam Brownback coming from behind in early polling to take a second term, U.S. Sen. Pat Roberts and Congresswoman Lynn Jenkins reelected to new terms, Becky Hutchins returning to the Kansas House of Representatives, a Republican winning the Jackson County Commission race and the GOP taking control of the U.S. Senate. 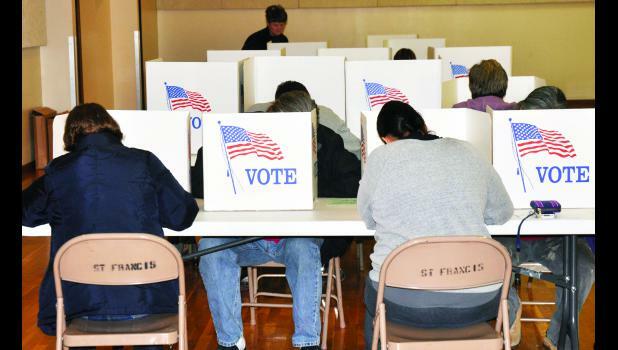 In Jackson County, more than half of the county’s registered voters turned out for Tuesday’s election, and nearly 10 percent of the county’s voters cast their ballots in advance, Jackson County Clerk Kathy Mick said. Of the county’s 8,898 registered voters, 4,873 cast ballots, including 835 advance ballots, for a turnout of 55 percent, Mick said. According to unofficial vote totals on Wednesday morning, votes in Jackson County tended to side with the state on who would return to office. Vote totals will not be finalized until the Jackson County Commission meets to canvass the votes at 10 a.m. Monday, it was reported. Two Kansas races — governor and U.S. Senate — drew national attention, with embattled Republican Gov. Brownback taking on Democrat challenger Paul Davis, who was favored to win and appeared to hold the lead in early polling. Brownback, however, came back to win, taking 50 percent of the state vote to Davis’ 46 percent; Libertarian Party challenger Keen Umbehr claimed four percent of the vote. In Jackson County, the story in the gubernatorial election was similar, with Davis holding a sizable lead in early polling. But the final numbers told a different story — Brownback won the county by five votes, 2,273 to 2,268. The U.S. Senate race involving incumbent Republican and Holton High School alumnus Pat Roberts and independent challenger Greg Orman started out close in early polling, but at the end of the night, Roberts won both the state and the county with 53 percent of the votes. Orman held 43 percent of the state’s votes and 42 percent of the county’s votes, while Libertarian candidate Randall Batson took five percent of the county’s votes and four percent of Kansas votes. Roberts’ victory reportedly helped enable the Republican Party to take control of the U.S. Senate, where Democrats holding onto a slight majority prior to the election lost six seats and a victory for Orman would have reportedly complicated the balance of power. Republicans held onto the U.S. House of Representatives by a sizable margin, it was reported. Congresswoman Lynn Jenkins, another HHS graduate, handily won a fourth term in the U.S. House, representing Kansas’ Second Congressional District, over challengers Margie Wakefield, a Democrat, and Christopher Clemmons, a Libertarian. In Jackson County, Jenkins took 62 percent of the vote, compared to 33 percent for Wakefield and five percent for Clemmons. Statewide, Jenkins held 57 percent of the vote, while Wakefield claimed 39 percent and Clemmons took four percent. At the state level, voters picked Holton Republican Becky Hutchins to return to the Kansas House of Representatives in District 61, replacing incumbent Republican Richard Carlson, who chose not to run for re-election. Hutchins won by two-to-one margins or better over Democrat challenger Vivien Olsen, winning 66 percent to 34 percent at the county level and 68 percent to 32 percent in the district. Kansas House District 62, which includes northern Jackson County, also saw incumbent Republican Randy Garber winning over Democrat Steve Lukert in Tuesday’s election. Garber’s margin of victory was small in northern Jackson County, winning by four votes with 51 percent of the vote to Lukert’s 49 percent, but districtwide, Garber won with 56 percent of the vote to Lukert’s 44 percent. On the county level, Republican Rob Ladner defeated incumbent Democrat Ed Kathrens to take the First District Jackson County Commission position up for grabs in the election. Ladner garnered 866 votes to Kathrens’ 825 votes, it was reported. Jackson County voters sided with the state on the question of whether to change the state’s constitution in order to legalize fund-raising raffles for charities. The question gained 71 percent of the yes vote at the county level and 75 percent of the yes vote at the state level. Also at the state level, Secretary of State Kris Kobach, Attorney General Derek Schmidt and State Treasurer Ron Estes, all Republicans, were handily elected to new terms. Republican Ken Selzer won by a 62-38 margin at the county and state levels over Democrat Dennis Anderson to take the Commissioner of Insurance office, a position currently held by Republican Sandy Praeger, who did not seek re-election.